The first of a collection of tandem Bible stories for children's ministry leaders and teachers. Each story includes presentation ideas, Scripture references, and a thematic connection. Each script can also be used as a pupper script. Easy-to-use tandem Bible stories that teach biblical truths in fun, livelyways. Tandem storytelling is a popular format of telling Bible Stories. 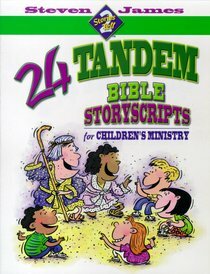 About "Stories 2 Tell: 24 Tandem Bible Storyscripts"